Chainsaw Carving and Art Site! 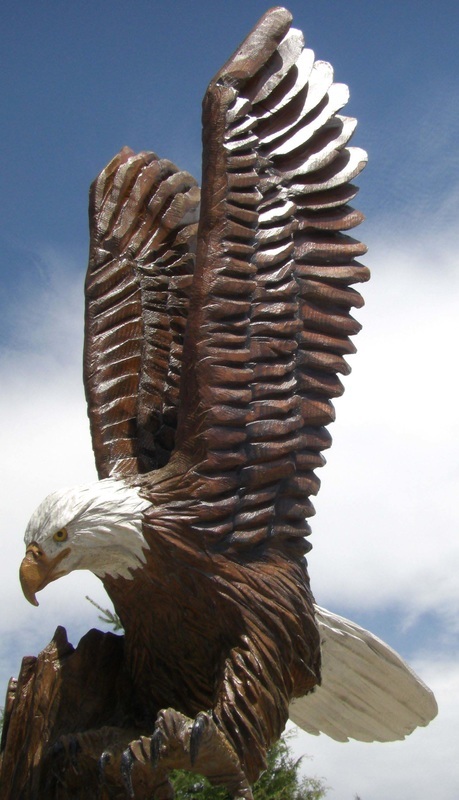 Jim Menken has been transforming old trees and logs into beautiful works of art since 2003. Inspired by nature, Jim uses his God-given talents, a chainsaw and a few other tools to depict animals, people, objects, etc. as realistically as possible. Many people have an emotional attachment to their trees and are sad when it is time for a tree to come down. Carving the stump is one way to extend its life and continue your enjoyment of the tree for years to come. Don't have an old tree? No problem . . . Jim can create a beautiful sculpture for you out of his own supply of logs. Carvings are a great addition to your outdoor living space. ​Prices vary according to size, type of wood and amount of detail. Jim is also available for carving demonstrations throughout the year and in the winter . . . ice carving and sculpture. Click on Portfolio to see photos of Jim's work, then call or email to discuss your ideas. ​Click on Process to watch the transformation of a tree stump into a beautiful piece of art.